Our Guide will meet you at the airport and take you to one of the best hotels in the center of Hanoi: Hilton or Sheraton, check in and free time. AM: Our tour guide pick you up at hotel, the trip takes you one day or half a day. Our tour starts with HoChiMinh Mausoleum, the Presidential Palace; this whole area reminds you some parts of the Vietnamese history and the most revered man of the nation. 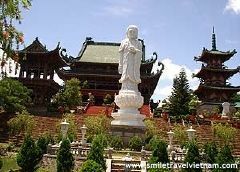 Then we’ll visit TranQuoc Pagoda-Nation founding pagoda, QuanThanh temple where you can enjoy the freshness of the West Lake and learn about the spiritual life of the Vietnamese. Lunch is served at a local restaurant with traditional cuisines. 12h00 On board start cruising and enjoying the beautiful sceneries of this World Heritage overnight in the Cruises. 13h30 Arrive in the hotel in Hanoi, free time. 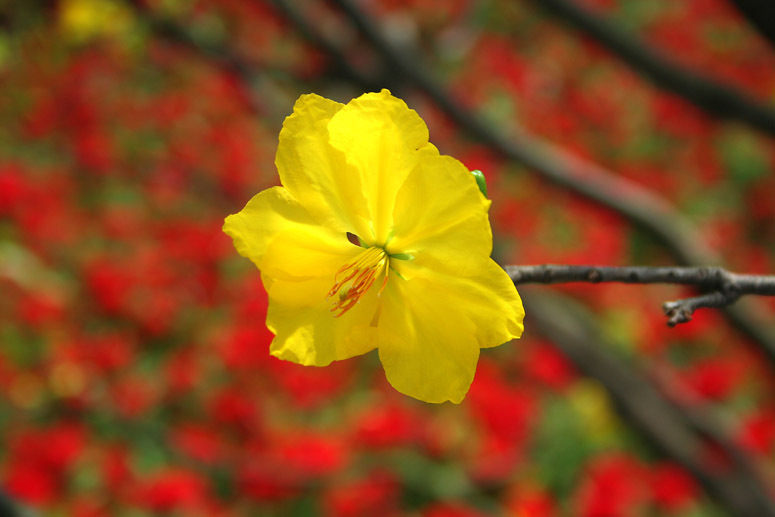 Pick up Phu Bai Airport transfer to Sai Gon Morin hotel, free time. The beautiful riverside pagoda of Thien Mu which now becomes the symbol of Hue, and the elaborate royal tomb of Emperor Tu Duc are not to be missed. 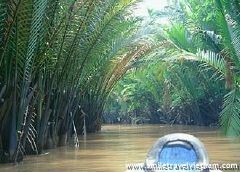 We include these in a half day cruise on the Perfume River which also gives us a taste of the scenic countryside as well as an enjoyable visit to the mausoleum of Emperor Minh Mang, in a tranquil setting of gardens and lakes. After an impressive boat trip we take a walk to the bustling Dong Ba Market that sells a wide variety of local goods and handicrafts. Along the way we pass many fantastic eating spots, all ideal for visitors to sample some local delicacies. Overnight in Hue. 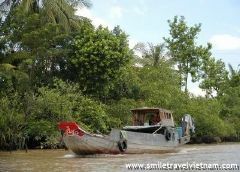 08h00: Our driver pick you up at hotel and transfer to Hoi An via Danang. 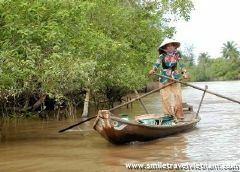 Heading out of the town, we drive south to Hoian which was originally a Cham seaport but has been influenced down the centuries by a myriad of traders from various cultures. Along the way we can break the journey in Lang Co Beach for a leisurely swim and an enjoyable visit to a nearby fishing village. The winding road begins as we make our way up the spectacular Hai Van pass. A view from the top of the pass is one of Vietnam’s most impressive panoramic scenes. The next stop of our trip is Da Nang which is famous for the Cham Museum. After seeing this sight we continue to the Beach and the Marble Mountain, whose peaks represent the five elements of the universe. 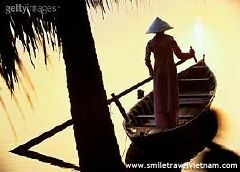 Arrive in Hoi An, check in Victoria Hoi An Resort, free time for visiting Hoi An Ancient Town. The ancient architecture of Hoian is a fascinating combination of Vietnamese traditional characters with Chinese and Japanese influence. 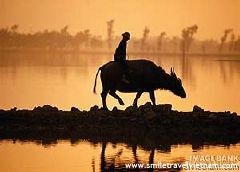 There are plenty to see in this delightful and tranquil town, some of which are the famous Japanese Covered Bridges, the Pottery Museum, the 200 years old Tam Ky House, the Chua Ong Pagoda, the vibrant market. We visit these on our morning walking tour past many low tiled houses scattered along the small streets and assembly halls which reflect the town's multi-cultural past. Over night in Hoi An. 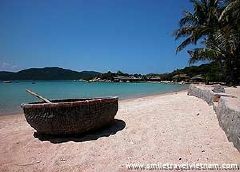 Arrive in Nha Trang, transfer to Anna Mandara or Vinpearl Resort free time for swimming. The fabulous sunny weather, turquoise water surrounding a string of islands and white sandy beach stretching the whole length of the city make Nha Trang one of Vietnam's premier beach resorts. After breakfast we board a boat for a day trip around the coastal islands, stopping on the way at a local fishing village to observe the island life. Today we also have lots of time on the blue clear water enjoying swimming and snorkeling or lazing on a beach. A seafood lunch is some enjoyment of the trip. 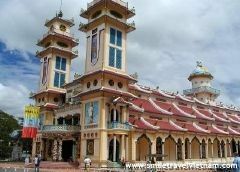 We arrive back in town late afternoon and visit the Long Son Pagoda and the impressive Ponagar Cham Towers, which are overlooking the colourful fishing port. 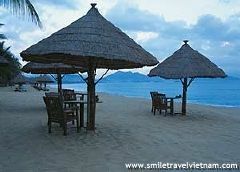 Overnight in Nha Trang..
Free time for beach activities. 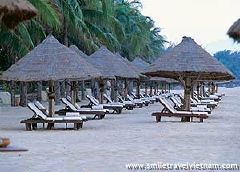 Transfer to Mui Ne overnight in Victoria Resort or Sai Gon Mui Ne Resort. Transfer to HCMC check in Caravelle or Sheraton Hotel free time. Free time untill Airport transfer for your out going flight.